Michelangelo’s iconic marble piece was initially intended to decorate the Duomo, as one of the figures from the Bible’s Old Testament, and was originally started by Agostino di Duccio in 1464. Di Duccio stopped working on the project in 1466, and the work was briefly taken on by another un-named artist, who also stopped for unknown reasons. 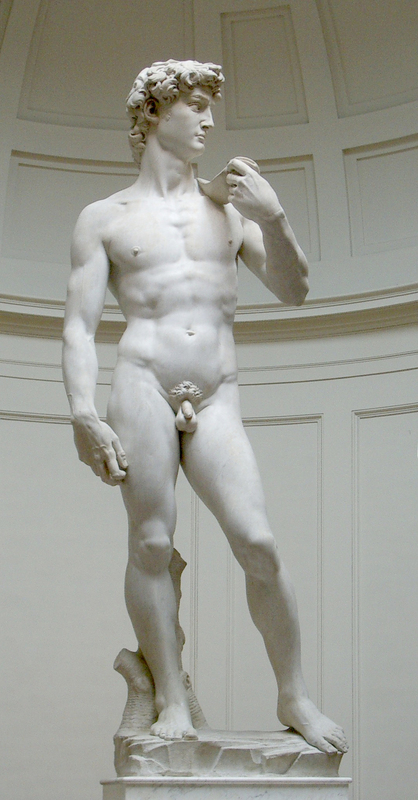 For 25 years, David stood unfinished and untouched, until Michelangelo took on the challenge in 1501, at the age of 26. When he eventually finished, three years later, the sculpture was too heavy to lift on to the roof of the cathedral, so it was placed, instead, just outside the entrance to the Palazzo Vecchio, the Town Hall of Florence. The original piece has since been moved to the Accademia Gallery, and a replica now stands in its place. Laocoon and his Sons is based on the mythical tale of a Trojan priest, Laocoon, who tried to expose the plan of the infamous Trojan Horse. For this, the sea god Poseidon sent sea serpents to kill him and his two sons. The sculpture, depicting the men in their final moments, struggling with the serpents, is said to have been completed by a group of three Greek sculptors from the Island of Rhodes, and was originally placed inside the palace of Emperor Titus. Regarded as one of the first to employ the High Roman Baroque style of sculpture, Gian Lorenzo Bernini created this particular piece for the Church of Santa Maria della Vittoria. It shows a Spanish nun, Saint Teresa of Avila, famous at the time for her transcription of an alleged encounter she had with an angel, welcoming the head of an arrow as the same angel plunges it in to her heart.